Moonet is another new release smart electric two wheel self balancing scooter and drifting board with LED light that runs on battery power- has two motors and two wheels. It is very easy to use and most people seem to learn it in under five minutes and you can go on the streets in just 15-20 minutes. It allows you to change direction, rotate and accelerate right on the spot with the zero degree angle corner radius and is capable of climbing the 15 degree angles. It has two motors working simultaneously and efficiently, double wheels and balancing systems in place to help keep your body in balance. Red Moonet weighs just 10kg and has the dimensions of 584 x 186 x 178mm so you can carry it easily in your hand to school or office. A full charge takes about two to three hours (100-240V 50 / 60HZ of charger voltage and should be charged between -10 degree to 50 degree Celsius as extreme temperatures will prevent it from being properly charged) and you can travel for up to 10-12 miles at a max speed of 10 miles on that single charge according to product specs (but it is best not to go beyond 6 miles per hour speed). Although it is advertised as a waterproof and rustproof unit according to IP54 standard- is OK to ride it in light rain and we don’t recommend it to be used in heavy rain, just in case. It is reported to be quite solid and robust (we do not have the scooter on hand) and is offered with a 2 year warranty by Moonet as a proof of its great build quality which also means it can be sent back for repairs or replacement during the first two years (shipping fee paid by the customer). Smart means it is quite an intuitive and responsive scooter that is very easy to control, is very convenient, runs smoothly and is also safe to use with great functionality and durability. LED light will come on when you turn it on and twinkles in case of protection situations. With a zero turning radius you can turn, rotate, break or accelerate in almost the same spot. Like almost all the other similar balance boards or scooters this is also made in China and these are basically same products with the same features and build quality so do not think you will get a better unit when you pay heaps more as the price can go up to 1800 dollars or so on these units- there are only slight variations on design (and this is at least the current situation). In the box you will find the Moonet Scooter, the charger and the User Manual with two years warranty. There aren’t many product reviews on Amazon just yet but all three customers gave it 5 stars out of 5- they seem to be very happy with their purchase. 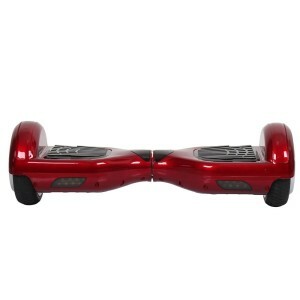 It is a lot of fun to use and can be used both as a mode of transport and a great entertainment tool.